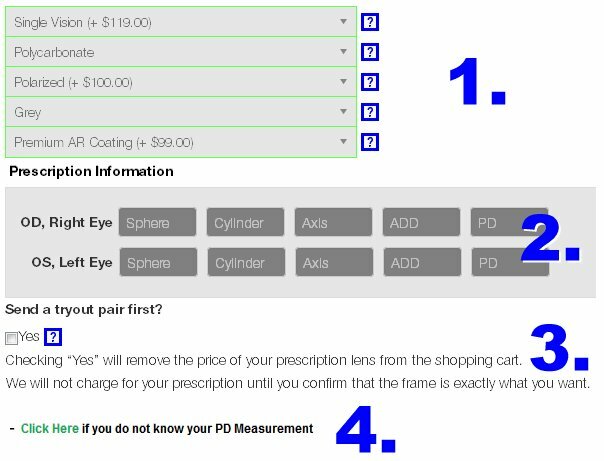 First we will show you the 4 steps in ordering a prescription lens. Then we provide a helpful explanation how the information on your prescription form relates to your eye. NOTE: Any time you have a questions about what to select in a drop-down menu click the info button to the right of these choices. A helpful window will open to explain your choices. Disclaimer: You really don’t need to know the information at the bottom of this page. This is for serious information junkies only. Click the tiny arrow to the right of the selection. A list of options will appear. If you have a question, click the Blue ? next to the selection. A pop-up window will appear that explains the option you are looking at. Each selection you make will bring up a new list of options. Answer each new question that appears. This is where you enter the information from your prescription form. If you're not sure what goes where just call us at (800) 381-9083 or email [email protected] We're always happy to help. If you check this box we will send a try-out pair of glasses so you can confirm that these are a perfect fit. 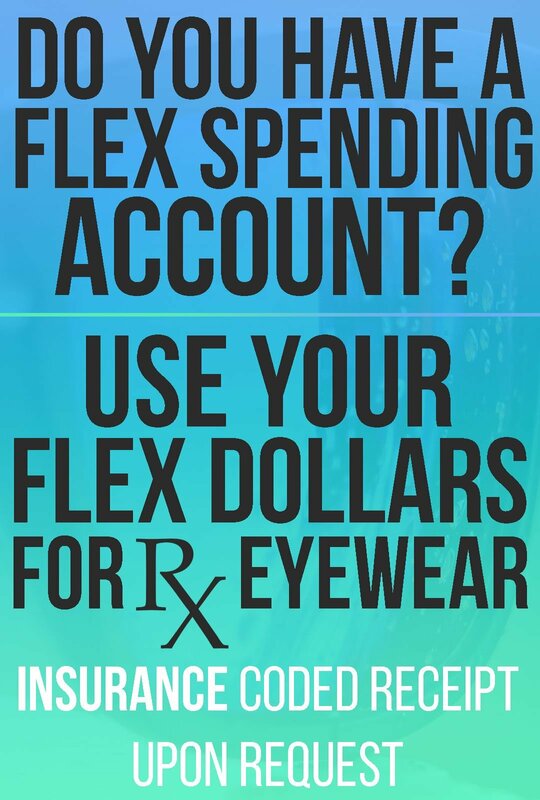 This will also subtract the price of your prescription lens from your order. Click this Try Before You Buy link to see the complete explanation on the page that appears when you click the ?next to YES. OD and OS translate to right eye and left eye. They're from the Latin words Oculus Dexter and Oculus Sinister. The first column on the prescription form is the Sphere power. If the lens on your eye is not perfectly spherical you will also have a Cylinder power. This is a measure of astigmatism. The Cylinder indicates how much difference there is in your prescription, and the Axis is where we should put this difference. Sphere and Cylinder will have a + or - in front of the power. The Axis will be between 1 and 180 degrees. Props may help us illustrate what the Sphere and Cylinder columns represent. So set a round plastic bowl in front of you and imagine that it's your eye. If your bowl has the correct curvature, images will come into focus clearly on your retina. Congratulations, you're emmetropic and you don't need corrective lenses. If the curve of your bowl is too flat, images will focus on a spot somewhere behind your retina, and you're farsighted or hyperopic. If the curve of your bowl is too steep, images will focus in front of your retina, and you're nearsighted or myopic. Hyperopes correct their vision with a plus lens. This is a magnifying lens, so the center is thicker than the edges. Myopes correct their vision with a negative lens that is thicker around the edges than it is in the center. Vision is perfectly in focus. This focal point is in front of the retina, so this person is myopic or near-sighted. Vision is corrected with a minus power lens. This focal point is behind the retina, so this person is hyperopic or far-sighted. Vision is corrected with a plus power lens. To illustrate Cylinder you can go back to your plastic bowl and gently push the outside edges toward the center with each hand. Now your bowl has a steeper curve in the axis between where you are pushing on it than it has in the axis running from top to bottom. If this represents your eye the power of your lens left to right will be more minus than the power in the axis that runs from top to bottom. This difference is the Cylinder power. This eye is spherical, so the prescription in every axis is the same. This prescription will not have anything in the Cylinder or Axis columns. This eye does not have the same curvature all the way around. So there is astigmatism in this eye. The Cylinder in this prescription will indicate how much different the prescription is from the strongest Axis to the weakest Axis. The number in the Axis column tells us the angle where your prescription will have the most power. This will always be between 1 and 180 degrees. The ADD column is for bifocal or progressive lens wearers. As we age, the crystalline lens behind the cornea becomes less flexible. It's a natural part of the aging process, and sooner or later it affects everybody. To focus on something close to your face, this lens must flex into a tighter arch. As it loses flexibility, it loses its ability to accommodate this tighter focus. This is called presbyopia, and it has nothing to do with being nearsighted or farsighted. Hyperopes (farsighted), myopes (nearsighted) and emmetropes (no correction needed) will all eventually lose their ability to focus on objects close up. The last column is Pupilary Distance, or PD. 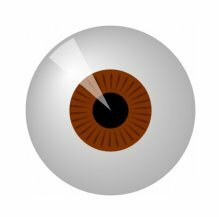 Your binocular PD is the distance from the center of one pupil to the other. The form above requests your monocular PD, which divides your binocular PD at the bridge of your nose. Faces are not always symmetrical, so these numbers may not be the same. This measurement is used to insure that you are looking through the optical center of a lens. If you cannot get this measurement from the last place that made prescription glasses for you just let us know. This obstacle is easy to overcome. We love a challenge. If you have a strong prescription, or you've had difficulty buying prescription-sports glasses in the past, we want to help. Just tell us what activity the glasses are for and send us your prescription. We will determine which glasses are most compatible with your prescription and send you a list of options. We will also give you our recommendation and tell you what we based it on. Email your request to [email protected] or fax it to (469) 310-0012. You are under no obligation, and there is no charge for this service. If your prescription is so far off the chart that it changes the standard prescription price, this exercise will also give us an opportunity to calculate that into the options we give you. You can't really understand prescription lenses without some knowledge of diopters and base curve, but I'm betting this is where you start feeling the need to go surf somewhere else. So click here, buy a pair of glasses, then come back and finish the page. Welcome back. These last two points deal with the curvature of a lens. The unit of measure used to indicate the strength of a lens is diopters. The strength of the SPHERE, CYLINDER and ADD powers are all are given in diopters. So just to reinforce this, let's say our next lens is three times as strong. Now we have a 3-diopter curve, so the radius of a circle created by extending this curve all the way around will only be about 7 inches, or one third the size of a 1-diopter curve. If parallel beams of light pass through this lens, they will come to a focus in 1/3 of a meter, or 3 times faster. The lens shown below illustrates why people who hate adding positive and negative numbers together shouldn't be opticians. The front curvature of a lens is on a convex surface, so the curve is positive. The back surface is concave. A concave surface will deflect light in exactly the opposite way as a convex surface would. For this reason, the curvature is measured as a negative. 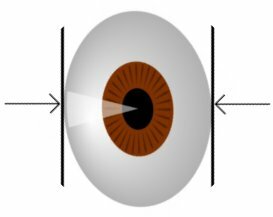 Therefore, a plus seven-diopter front curve and a minus 6-diopter back curve will produce a lens with a power of plus one-diopter. The front and back curvatures are added together to arrive at the power of the lens. If the front curve stayed the same, and the back curve was increased to minus nine, we would have a negative lens. The power would be minus two, and the edges would be thicker than the center. This prescription would be for a myopic or nearsighted person. Base curve is a term that should be understood by anyone who wears any kind of glasses, prescription or not. Sunglass manufacturers often display terms like base 6 or 8-base in the description of their products. This indicates the curvature measured in diopters on the front side of the lens. If the lens is a plano lens (no power), the back curvature will be the exact opposite of the front. Many people find that their eyes become accustomed to a base curve, and getting used to new glasses that have a different base curve requires some time. The new free-form lenses make it much easier for people to get acclimated to a new base curve, but if you have ever struggled with getting acclimated to a new pair of glasses you might want to look at 6-base glasses instead of 8-base frames. Congratulations. We are sincerely in awe of anyone who has the tenacity and thirst for knowledge to make it this far down the page. Frankly, we think you're a little weird, but we're still really impressed. We are often asked if we can put prescriptions stronger than -10.00 in frames with a big 8-base curve on the front. The answer is yes, we can do almost anything. But these shoppers really should be informed consumers. There is new lens technology called "Free-Form Lenticular" that can make these lenses much thinner than has ever been possible. Even without this Lenticular design we can put these higher prescriptions in wrapped frames, but that doesn't mean it's a good idea. The term "8-base frame" indicates that the eyewear frame has the same curve as a +8 Diopter lens surface. This curve is about the same shape as a full-size adult head. Therefore sunglasses with an 8-base curve typically provide the best protection from the sun, they fit better on your face, and minimize "bounce-back". (Bounce-back refers to the sun hitting the back of the lens and reflecting into your eye.) This shape is even more important for high-speed sports like motorcycling where the eyewear also needs to prevent air from swirling around behind the lens. 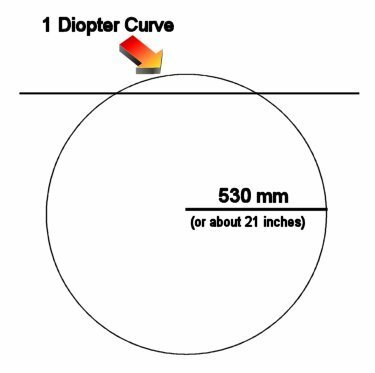 If you memorized the Diopter information above, you know that a high minus prescription in a frame with a +8 curve on the front will create a very steep back curve and a lens that is very thick on the outside edge. For example, a -6.00 prescription lens in an 8-base frame will have a back curve that is -14.00. The steeper this curve is, the smaller the in-focus portion of the lens will be. High index lens materials are often used to flatten lens curves and reduce lens thickness, but this is not an option for sports eyewear. High index lens material will bend light more efficiently and make the lens a little thinner. But all of the higher index materials are breakable. Having a lens that can shatter is not what you want in front of your eyes for sports activities, and certainly not what you want for activities like motorcycling. Wiley-X has a great way to solve this dilemma. They created a way to modify some of their frames that allow us to mount a 6-base lens in an 8-base frame. More details will be posted here soon. The new Lenticular lens design will always result in the thinnest lens on a wrapped frame. For some higher prescriptions on frames with wide lenses the Lenticular design is our only option. Any prescription lens consists of a lens where the curve on the front of the lens is different than the curve on the back. The stronger the prescription is, the more variance there will be from the front curve to the back curve. Therefore, the larger the lens is, the thicker it will be. This thickness is exaggerated on wrapped frames, especially if the prescription has a minus power. In a Lenticular lens design the usable part of the lens does not extend all the way to the outside edge. This can result in a lens that is up to 70% thinner. OK, you made it to the end. Most people in our office pool were betting that no more than four or five people a year would actually get to the bottom of this page. We're thrilled that you took the time to finish it, and we would be equally thrilled to hear from you. Click here to let us know you made it. If you still have time, let us know if you think you'll ever use anything you just read here. 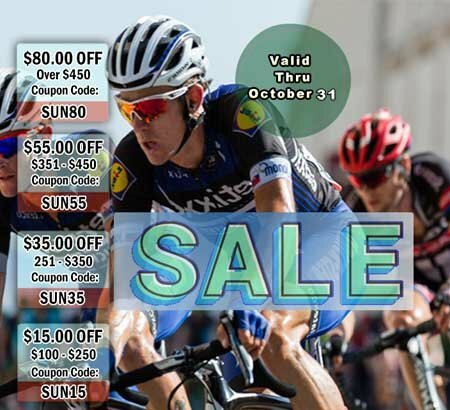 To show our appreciation for your input we will send you a promotion code worth 10% off your next purchase. Thanks. You're our hero.